What Happens When Metals Undergo Heat Treatment? Before modern metalworking techniques were invented, blacksmiths used heat to make metal workable. Once the metal was formed into the desired shape, the heated metal quickly was cooled. Quick cooling made the metal harder and less brittle.​ Modern metalworking has become much more sophisticated and precise, allowing for different techniques to be used for different purposes. Subjecting metal to extreme heat causes it to expand in addition to impacting its structure, electrical resistance, and magnetism. Thermal expansion is pretty self-explanatory. Metals expand when subjected to specific temperatures, which vary depending on the metal. The actual structure of metal also changes with heat. Referred to as allotropic phase transformation, heat typically makes metals softer, weaker, and more ductile. Ductility is the ability to stretch metal into a wire or something similar. Heat also can impact the electrical resistance of metal. The hotter the metal gets, the more the electrons scatter, causing the metal to be more resistant to an electrical current. Metals heated to certain temperatures also can lose their magnetism. By raising temperatures to between 626 degrees Fahrenheit and 2,012 degrees Fahrenheit, depending on the metal, magnetism will disappear. The temperature at which this happens in a specific metal is known as its Curie temperature. Heat treatment is the process of heating and cooling metals to change their microstructure and to bring out the physical and mechanical characteristics that make metals more desirable. The temperatures metals are heated to, and the rate of cooling after heat treatment can significantly change metal's properties. Annealing is a form of heat treatment that brings a metal closer to its equilibrium state. It softens metal, making it more workable and providing for greater ductility. In this process, the metal is heated above its upper critical temperature to change its microstructure. Afterward, the metal is slow-cooled. Less expensive than annealing, quenching is a heat treatment method that quickly returns metal to room temperature after it is heated above its upper critical temperature. The quenching process stops the cooling process from altering the metal's microstructure. Quenching, which can be done with water, oil, and other media, hardens steel at the same temperature that full annealing does. Precipitation hardening is also known as age hardening. It creates uniformity in a metal's grain structure, making the material stronger. The process involves heating a solution treatment to high temperatures after a fast cooling process. 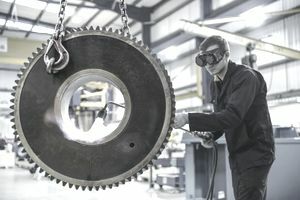 Precipitation hardening is usually executed in an inert atmosphere at temperatures ranging from 900 degrees Fahrenheit to 1,150 degrees Fahrenheit. It can take anywhere from an hour to four hours to carry out the process. The length of time typically depends on the thickness of the metal and similar factors. Commonly used in steelmaking today, tempering is a heat treatment used to improve hardness and toughness in steel as well as to reduce brittleness. The process creates a more ductile and stable structure. The aim of tempering is to achieve the best combination of mechanical properties in metals. Stress relieving is a heat treatment process that decreases stress in metals after they have been quenched, cast, normalized, and so on. Stress is relieved by heating metal to a temperature lower than that required for transformation. After this process, the metal is then slowly cooled. Normalizing is a form of heat treatment that eliminates impurities and improves strength and hardness by altering the grain size to be more uniform throughout the metal. This is achieved by cooling the metal by air after it has been heated to a precise temperature. When a metal part is cryogenically treated, it is slowly cooled with liquid nitrogen. The slow cooling process helps prevent thermal stress of the metal. Next, the metal part is maintained at a temperature of roughly minus 190 degrees Celsius for about a day. When it is later heat tempered, the metal part undergoes an increase of temperature up to approximately 149 degrees Celsius. This helps to lower the amount of brittleness that may be caused when martensite forms during cryogenic treatment. What Is the Metallurgy Term Known as Tempering? How Does Cold Working Strengthen Steel?